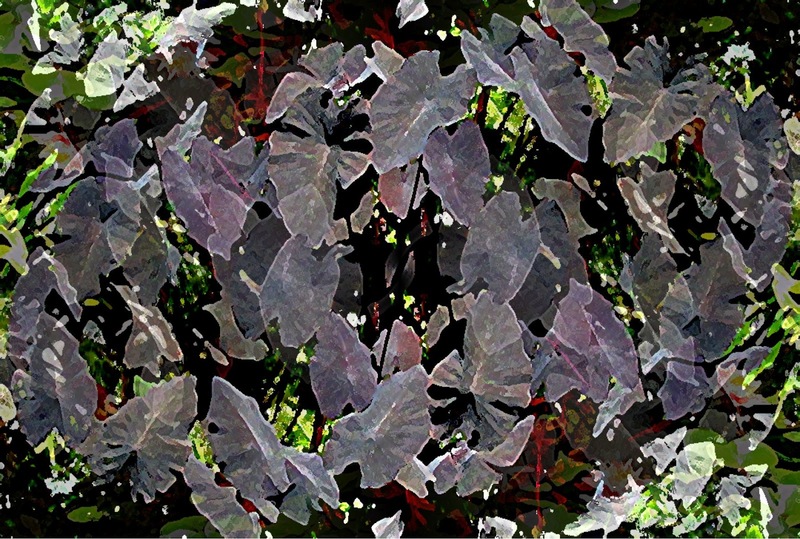 Inspired by the Great Weaver Spider Woman. 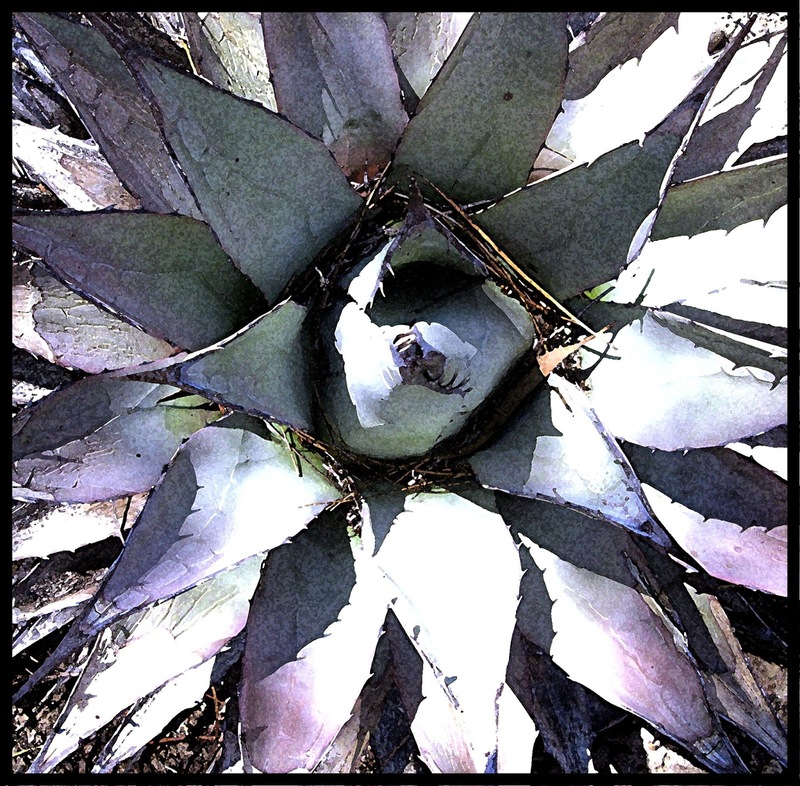 "Indigenous people have always known corn metaphorically in two or more of the four senses, mother, enabler, transformer, healer; that I use throughout this weaving. Although early European settlers took the grain only, there is evidence in America today that the Corn-Mother has taken barriers of culture and language in stride and intimated her spirit to those who will listen, even if they don't know her story or call her by name." "Native American Indian legends tell of The Corn Mother sacrificing herself so that her people could have life. According to her instructions, in one legend, she was to be killed, her dead body dismembered, strun among the fields and planted. In harvest ceremony after harvest ceremony the last sheaf of corn was gathered together and dressed in women’s clothing. This Corn Mother doll was referred to as The Old Woman, The Old Grandmother, Old Wife or even The Great Mother. To assure a plentiful harvest The Old Corn Mother was given to a family for safe keeping until the next growing season began and the cycle of birth, growth, death and rebirth continued. As I looked further into what I had learned about the archetype of the old woman, I realized that the power of the “Old Woman” is her ability to embrace change, her willingness to give birth to her Old Self, to make friends with her death and trust in rebirth." I recently made a new Corn Mother mask, which I'm taking with me on my travels (my brother's funeral in California, then a trip up the coast). She wanted to come with me, and I will be taking the masks to show my friends Mana and Annie in Willits, to receive a blessing for it. The story of the previous Corn Mother mask was quite wonderful, and although I've shared it before, I felt like re-posting it here. 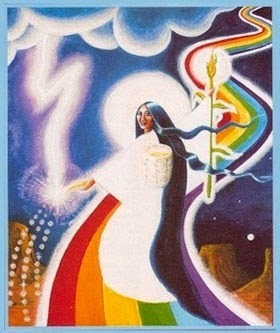 Corn Mother is the Sustainer of the Americas, sacred in virtually all native American traditions. I hope this mask will find many new Dancers to share Her ever evolving stories. "And where corn is the Corn-Mother is also.‘This thing they call corn is I'." Corn Mother has many names, and among the Cherokee she is called "Selu". The story is that Selu fed her family with delicious grain, but no one knew where it came from. 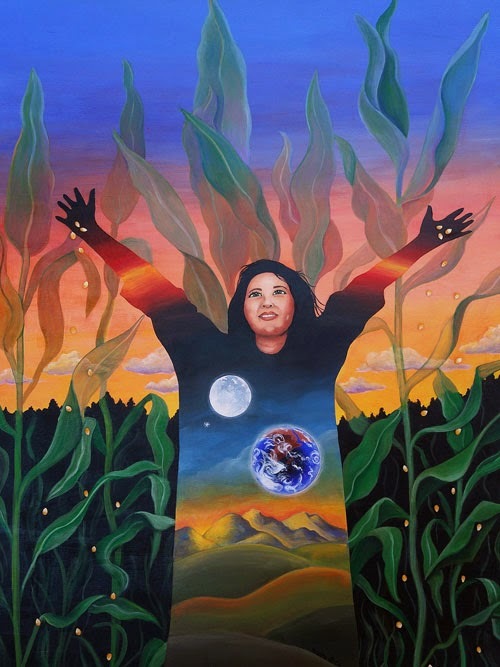 Finally her sons saw her shaking corn from her body, discovering her secret. They had witnessed a mystery they could not understand. Being young, fearful, and ignorant, they resolved to kill their mother, calling her a witch, and making disasterous assumptions about her power. Knowing she could not give them wisdom, nor teach them the ways of nature, Selu tells them to bury her body in the earth, and thus is born again each year to nourish her children. Selu does not punish - In loving generosity, She offers her children a chance to return to good relationship. My own relationship with Selu began in 2002. I had given masks to choreographer Manna Youngbear to work with, and had been gone all winter. I didn't know what her program was going to be, and I looked forward to attending the performance. Several weeks before her event, I attended an unrelated event at the Ritual Center in Oakland, founded by Matthew Fox. As I sat on the floor during a lengthy meditation led by a woman minister , I found myself absorbed by a vision. When I closed my eyes I saw a Native American woman dancing. I opened my eyes, and closed my eyes again, and still she danced in my imagination, ears of multi-colored corn in her hands. It was so clear that when I returned to my studio, I made a mask with corn on each side of the face. I had been reading about Black Elk, the great Lakota teacher. As a young boy, he foresaw the destruction of his people, what he called the "hoop" of the Lakota nation. But he also prophesied a "hoop of the nations": a great circle, composed of many interlocking circles, that would someday come to be. A Rainbow Tribe. I painted a rainbow on the mask's forehead, because the children of America are now of all colors. 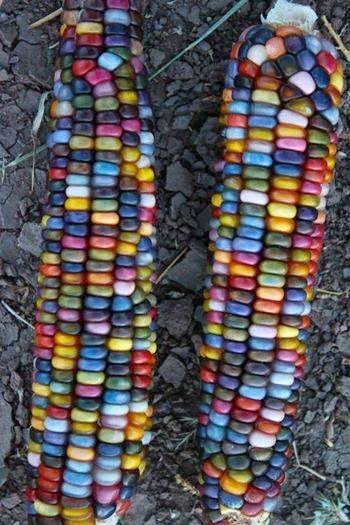 "When I held up an ear of calico corn" Cherokee poet Marilou Awiakta wrote, "we would think about this wisdom of the Corn Mother. How the different kernels are ranged around the cob, no one more important than the other. How each kernel respects the space of those on either side, yet remains itself - red, black, white, yellow or combinations of those colors. How the Corn-Mother, in Her physical being, exemplifies unity in diversity." Just before her performance, I learned there was one dancer in Manna's cast who had no mask, Christy, who felt inspired to dance Green Corn Woman. Now it seemed she had her mask. Here is the story Christy told me when we finally met, and the new mask was delivered. I made a bouquet of corn for Manna's wedding, with a necklace of rainbow beads I bought at a garage sale. I later used this same bouquet I to dance Green Corn Woman. Manna is part Cherokee, and when she cast her show, she asked if I wanted to dance Corn Mother. We didn't have a mask for her, but I was inspired to dance anyway. I knew very little about the Native American Corn Mother, about Selu, who is Cornmother to the Cherokee. I planned on doing some research. Along the way, I remember stopping at a used bookstore. Opening a rather esoteric book at random, I discovered I was looking at an article about the Corn Maiden. I was further stunned to find it illustrated by Vera Louise Drysdale. Vera was my friend, years ago, when I lived in Sedona. And so, without any further urging, I was ready to begin. The feeling of familiarity continued as I created a costume. I was looking for materials I would need, and within a few days, Manna left a message. "Christy" she said, "There is a Hopi woman visiting Isis Oasis Retreat Center, and you need to meet her! She gave me some 300 year old corn meal to give to you!" Once again, I felt Selu encouraging me! I thought about what She meant to me personally. To me, Selu is about the wealth that comes from the work of forgiveness. How can we be fed and sustained, how can we create peace, if we cannot practice the lessons of forgiveness, if we cannot learn tolerance and compassion for our differences? That is the beginning place for the cooperation we will need in order to evolve into a global family. In America, we have mixed bloodlines, "rainbow blood". Especially as Americans, our challenge is to understand our true relationship to each other. I've always conceived of the Rainbow as actually being a circle. Half of the rainbow disappears into the ground, into an underworld realm, where it exists beneath the Earth, hidden, but present. Like the Corn Mother. Aren't we all Her children? Perhaps, what she gives us now is the means to seed a rainbow vision. We received the new mask at the time of the lunar eclipse, in May of 2002, and decided it was an auspicious time to consecrate it with our dried corn. As we did, a flash of light went off in the room! At first we thought it was a light bulb that blew out. But no electric lights had been turned on in that room. We looked at each other amazed, and felt the presence of Corn Mother. "And shaken, we know the immanence of Mystery, and Change." A few weeks ago I ran across a Tor paperback with two novels at a yard sale, and took home a book with a story by Ursula Leguin ("The New Atlantis" and Kim Stanley Robinson ("The Blind Geometer"). There was a kind of synchronicity in this purchase, because on the cover it said: "Plus the bonus novelette THE RETURN FROM RAINBOW BRIDGE". Having worked for 20 years on The Rainbow Bridge Oracle, it seemed worth investing 50 cents in. The Leguin story was so disturbing for me I couldn't finish it, because it reflected, in a strange way, the despair I sometimes feel at the falling away of our world, the sense that we, too, are living "before the deluge". And Robinson's story even more so - I couldn't plow through it. Which is unusual for me, as I usually devour SciFi insatiably. But something prompted me to Google Robinson, who I had never heard of before, figuring he was some obscure writer no one remembers........and I found him, and Leguin, reading at an extraordinary conference in Oregon called Transformation without Apocalypse: How to Live Well on an Altered Planet,which occurred on February 14-15, and featured Joanna Macy, Ursula K. LeGuin, Tim DeChristopher, Kim Stanley Robinson, Rob Nixon and other speakers. Wow..........wish I had known! If they're having another conference next year, by golly, I'm going! 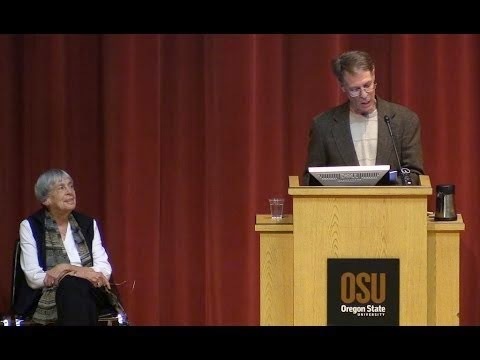 Hearing Mr. Robinson speak I see that he is a visionary writer, very concerned in his work for the environment and the future...........and what a treat to hear him with Ursula Leguin, who has been my mentor, and has created worlds I've visited many many times, for 35 years. Synchronicity, following the threads of Spider Woman..............leading me always to answers, in the same gestalt way that dreams can lead us to what we need to know or to affirm. The "Rainbow Bridge", in Nordic mythology, was the bridge between the realm of the Gods and the Earth. The Rainbow Bridge, to me, is also the vision that bridges together our human diversity, what Black Elk called "the Hoop of the Nations", into a common humanity. It seems to me that building that Bridge, spiritual and practical, in this time is, among others, the work of artists of all kinds, which Leguin and Robinson so eloquently elucidate. What caught my attention enough to buy a little book led me to where I needed to go. "Humans will be living differently in the very near future, perhaps occasioned by catastrophes brought on by overpowering forces of greed and climatic disintegration. But it’s also conceivable that we will choose, by acts of imagination and collective will, to create new narratives of how to inhabit the planet. This will require a radical re-imagining of who we are in relation to the world and how we ought to live. We have to be doing everything possible to end dependence on fossil fuels, stop the privatization of water, seeds, and the very atmosphere, and arrest climate chaos. But that work will fare better if we have tangible visions of new / old ways to live that promise thriving without exhausting the Earth. This symposium will engage the essential experiment, testing a different sets of ideas about how to live on Earth." Of quiet birds in circling flight. I am the soft star-shine at night. I really don't know how to write this entry, or even if I should, because it's both very personal and conflicted. But I want to try. In 2008 my brother suffered a brain stem stroke. Because he did not have a living will, since then he has been on complete life support. In 2009 he was pronounced brain dead. 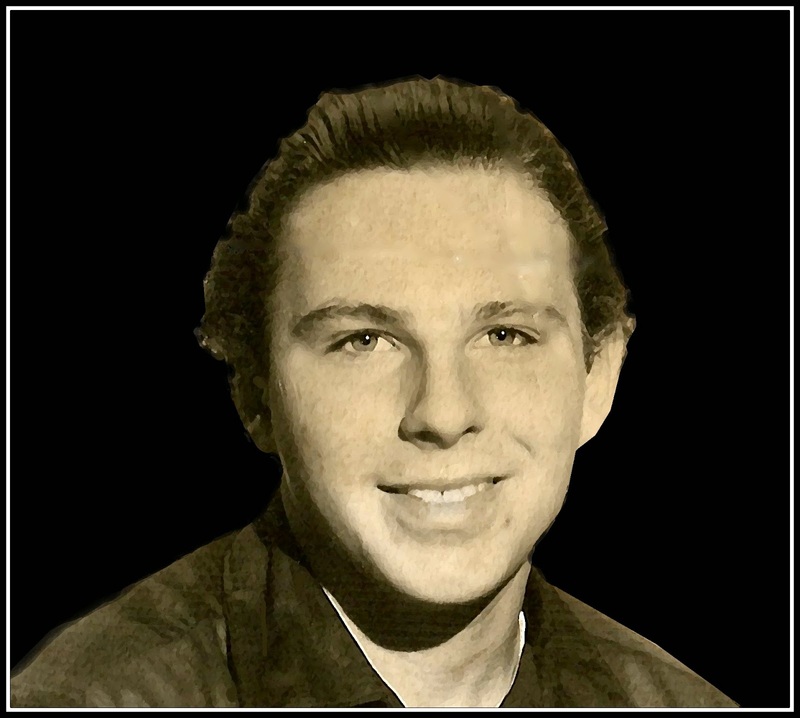 My mother is now in a nursing home with Alzheimer's, and my other brother has finally agreed to allow me to withdraw life support for Glenn, which we will do on the 15th of this month. Above is a card I made for Glenn in 2009 when I created a "Dia De Los Muertos" Alter at Wesley as their resident artist. 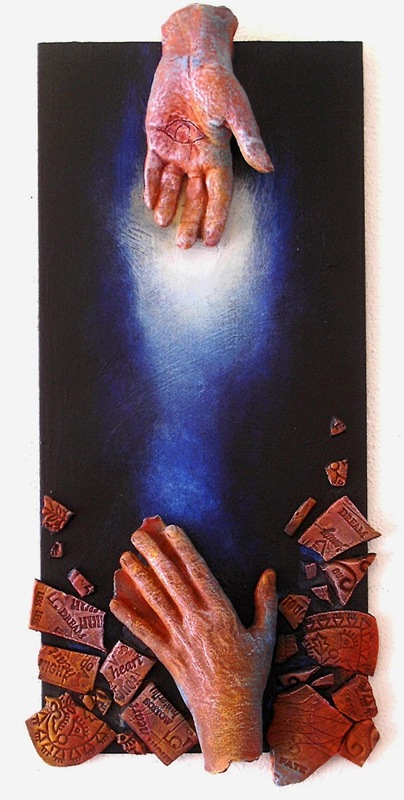 Below is one of the sculptures I made in 2009 for Glenn, honoring his long interest in Buddhism. All of them have tiles with words and phrases pressed into the clay, symbols and antique designs, all of them, like pottery shards, broken, disordered, "de-constructing". In this realm of being, words and symbols are what we construct our ideas of life from, the "shells" we create our identities from. In "Form is Empty" I saw the hand of the dying reaching through the shattering of form toward the offering hand of the Divine, the greater Self. It's been such a long time that I have grown numb to it, to be honest, worn out. I've tried all kinds of strategies to come to grips with the situation, including calling in a medium several times who told me that Glenn was not in his body, and that he had "crossed over". I was comforted by that. Towards the end of his life Glenn was a bitter recluse, and I know that he was tired of the life he had. That made the situation that much more awful to me. I'm relieved that this is soon going to be over. I suppose it sounds hard, but people take a long time to die, and after a while, you just have to go on with life, or you lose your life to the dying. I was my beloved grandmother's caretaker for 5 years as teenager, and I learned after a while to be "selfish" enough to allow myself an adolescence. To survive in a family with much dysfunction. In many ways, Glenn was the most sensitive sibling, talented and intelligent, and I'm not sure he did "survive" - so many of the things he wanted to do he never was able to. I often think of the quote above from the Gospel of Thomas. I think Jesus was talking about the great creative drive that every being incarnates with, a kind of individual purpose or purposes we all have. We have to be responsible to the needs of family and tribe.........but we also have to honor what Joseph Campbell called "following your bliss", your unique path and calling. Sometimes the demands of family or tribe are wrong, the values inappropriate. Sometimes relationships keep us from evolving..............In examining my life, I'm glad I was both rebellious and "selfish". I wish Glenn had been able to do so as well, and I think of him free, and able to create a new life in the other realms. One story I remember was in 2011, when I began to remodel my mother's house after she went into assisted living. My other brother, David, left Glenn's room exactly as it was, including a locked closet that was full of guns, reflecting the paranoia and isolation Glenn felt. David refused to open it. Finally, when he went back to California, I decided to clear out Glenn's room no matter what David thought, and I painted it a bright sky blue, as a ritual, to embody peace, and the open sky, release. As I was painting around the door of the locked closet.........it very gently opened! 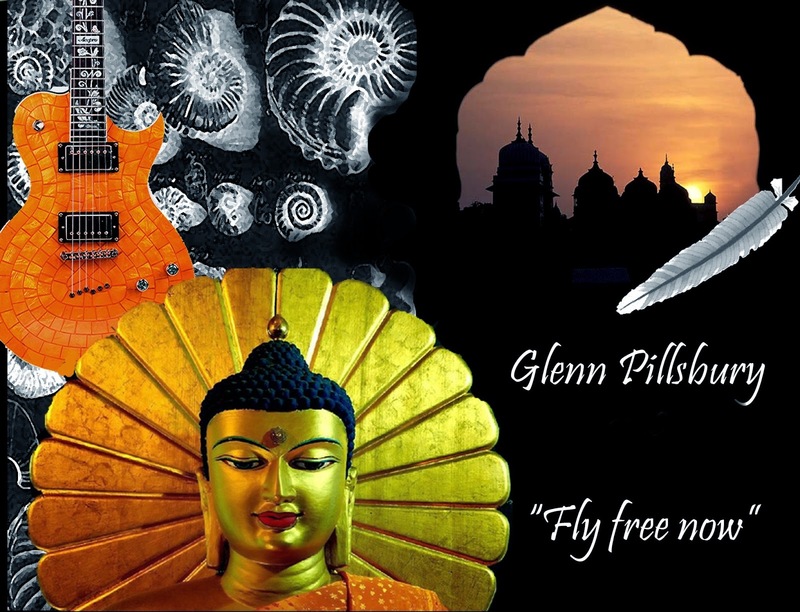 I took the guns, sold them, and sent the money to a couple of charities, including sponsoring a girl in Nepal, which I felt was another way to change the energy, to "open the way" for Glenn's spirit to be free. I like to think, am pretty sure, that that opening door was Glenn's way of letting me know that all was well. Unfortunately, my other brother refuses to consider anything he thinks is "metaphysical nonsense", so he's unable to benefit from experiences like this. In the 2nd piece, "The Heart Sutra", I used the hand of a 90 year old woman and a 9 year old child. The Heart is what lies between. One of the things I hate about any kind if fundamentalism is the endless heavy footprint of patriarchal preoccupation with sin, punishment, torture, etc. The Old Testament tribal war gods have a lot of rules, and no mercy. I've met people so terrified of death because they feel they'll be tortured forever by some vicious god or devil. 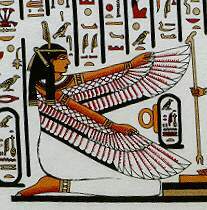 How much wiser the Egyptian concept of Maat, who holds a feather and a scale before the door of death and new life. With "the Questions of Maat", the Goddess helps souls to weigh the lives they've had, to understand, to "fore-give" and be "fore-given". She is both grief and praise, and as I understand the word "forgive", it means to not hold on, but to release the energy in order to give it fore-ward, into new form, new love, new creation. When at last each soul is "as light as the feather of Maat", the door opens, and they can pass on. "Then in the Arctic half-light of the canyon, all existence fades to a being with my soul and memories and the sounds of the Big Blackfoot River. Eventually, all things merge into one, and a river runs through it. The river was cut by the world's great flood and runs over rocks from the basement of time. On some of those rocks are timeless raindrops. Under the rocks are the words, and some of the words are theirs. " Norman MacLean, "A River Runs Through It"
The last piece, "Holy Mother Take Me Home", is a prayer to the Goddess, the Source. I used a child's hand again, and the broken shards, with all the words, float down the river of light. We're all children, really, all children. She reaches out Her hand to take us Home. It doesn't matter what you've done, where you've been, what kind of life you think you've led or not led. She waits. It's been a long journey Glenn. Be at peace. "We have been raised to think that our body ended here, with this bag of skin, or with our possessions or education or house. Now we begin to realize that our body is the world." 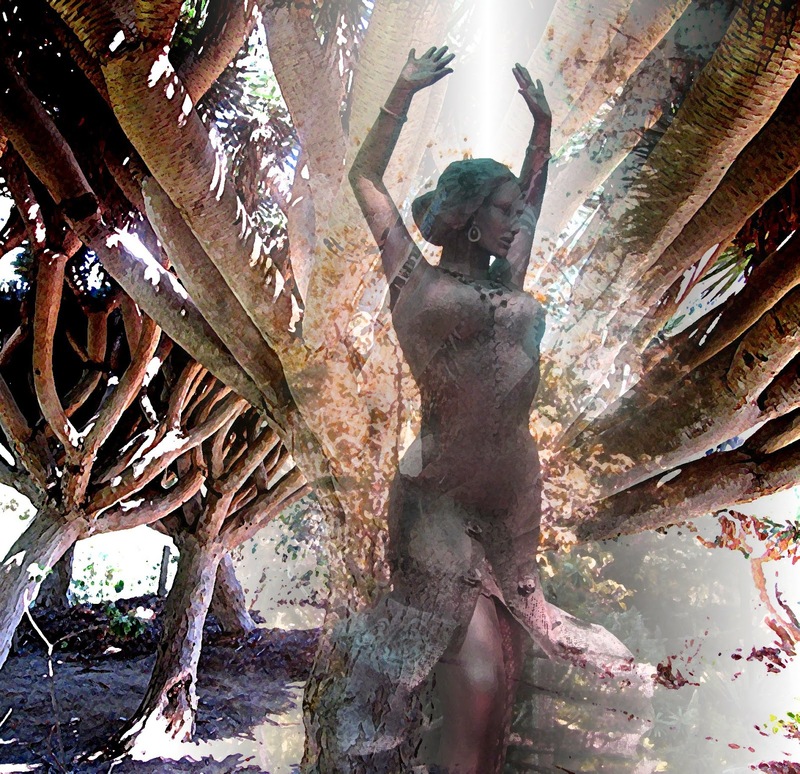 When Sulis appears take note of any psychic visions or premonitions while seeking Her help in their understanding.........On your next visit to a hot spring, invoke the name of Sulis as you meditate on the healing of your body and soul. Call on Sulis for blessings on your personal journey to light, health, and wholeness. I've always loved hotsprings, and visited many, as well as living for a while in Truth or Consequences, New Mexico, an ancient place of hotsprings along the Rio Grande. Going to the springs has meant many things to me, healing, detoxing, but most of all, clearing away the dross so that the divine could shine through. I always take my journal and a sketchbook. It never fails that after a day or so at a hotspring all kinds of visionary things happen, including synchronicities. In 2012 while staying for a few days at Essence of Tranquility hotsprings in Safford an entire art project called "Numina", complete with a written Proposal, popped into my head while sitting in a pool of water! 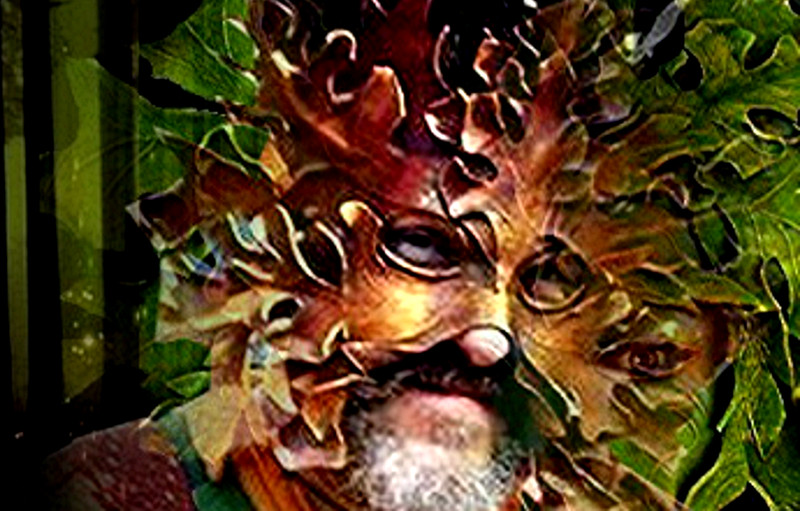 I called it my "hot springs Satori".......That became the series of masks I called "NUMINA - Masks for the Elemental Powers" in 2013, and I was further blessed when Ann Waters and Mana Youngbear in California produced a play with them. Actually, in 2007 something similar happened at Tonopah Hot Springs. I had received an Aldon Dow Fellowship, and was going to pursue my Spider Woman's Hands project in Michigan. 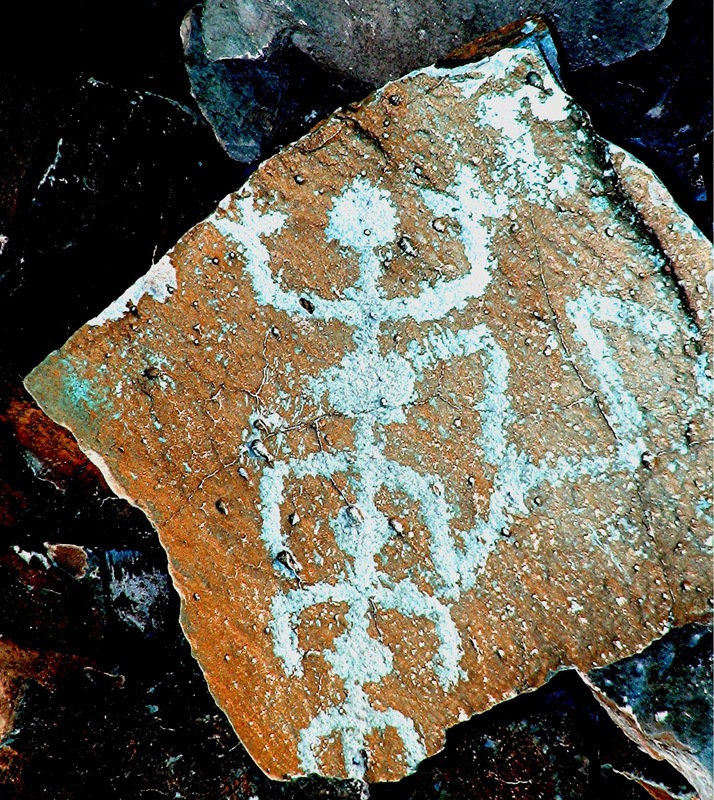 5 months before leaving I was sitting in a tub at Tonopah, and chanced to talk with someone who lived there.........he took me that day to a petroglyph site in the area, and gave me some of his own photos of petroglyphs. One was, undoubtedly, a spider - Spider Woman. I have used that photo as a logo many times. I think that qualifies as the "oracular powers of hotsprings". The springs at TorC were so revered by native people that there was an agreement that, regardless of the continuing warfare of various tribes, there would be no conflict allowed at the springs. Many of the Goddesses and Gods of world mythology began as what the Romans called "Numina", the Genius Loci or Spirit of place. For the Romans, as for virtually all early peoples, a healing spring was overseen and inhabited by an indwelling intelligence, an indwelling guardian. Little shrines were always made to the Numen, and often, as in the case of a healing spring or a place of oracular power, the Numina were consulted, petitioned, and honored. 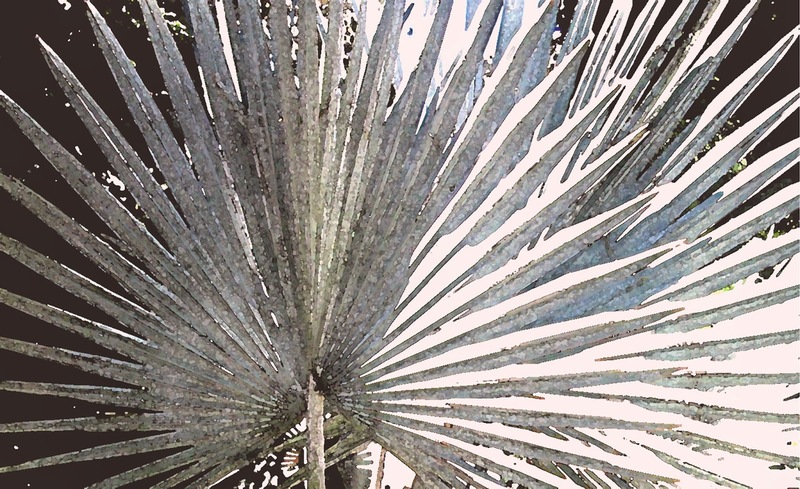 This understanding that place was alive, conversant, and human beings were a reciprocal part of that conversation (a contemporary way of putting it might be "local ecology") was expressed and understood through myth making. 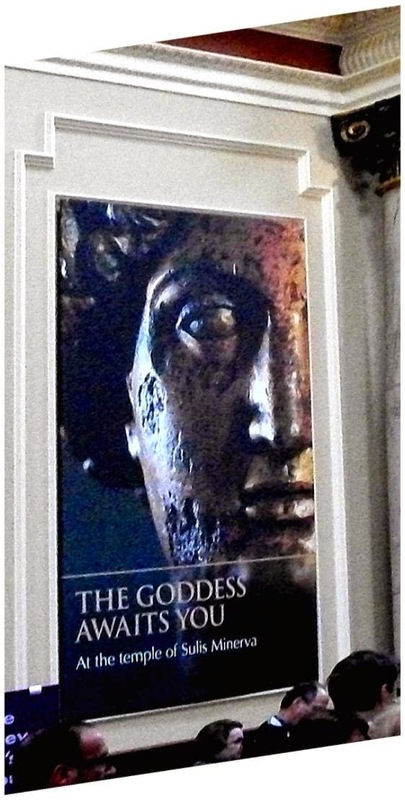 So it is no surprise that when the Romans encountered the revered hotsprings of Bath, in Southern England, and built their baths there, they honored the Celtic Goddess Sulis (Aquae Sulis ("the Waters of Sulis"), and later incorporated her name with that of the Roman Goddess Minerva. The Roman bath becamed dedicated to Sulis/Minerva. Sulis's name come from a root meaning "eye" or "gap", referring perhaps both to the spring from where half a million gallons of hot water still well up every day, as well as to Her powers as seeress. I took the photo above while I was waiting in Bath for a bus in 2011 to take me to the Goddess Conference in Glastonbury. I think the Oracular power of Sulis, and the baths of Bath............continue. at least for me! And so, at last, I'm able to honor Her with a mask. The hot spring at Bath has been renowned for its healing powers since ancient times. Pilgrims came from mainland Europe to bathe in the therapeutic waters, and references to Sulis are known from as far away as Germany. The Romans equated Sulis with their Minerva, and so She was known to them as Sulis Minerva--which is unusual, since the Romans generally used the native Celtic deity name after the Roman name. This is taken as an indication of Her importance and fame. Sulis, a Gaulish and Brythonic goddess, has the iconography of a solar deity. The name “Sulis” has a complex etymology, with various overlapping meanings. Her name may be related to the proto-Celtic word for sun, from which the Old Irish súil (eye) was derived. which probably leads to one of Her titles, “The Bright One”. Her hair radiates around her face like the sun surrounded by sun rays. Another interpretation of the name Sulis is “Provider of Healing Waters”. She is associated with healing springs in general and the natural hot springs of Bath, England in particular. Archaeological evidence shows that the mineral hot springs at Bath were first used by Neolithic people at least 10,000 years ago. The Celts, who arrived in England around 700 BCE, probably found Sulis already ruling there. Most likely they built the first shrines at the springs. The Celts, who honored the sun on Beltane instead of the summer solstice, held their fire-festival on May 1 in reverence of Sulis. 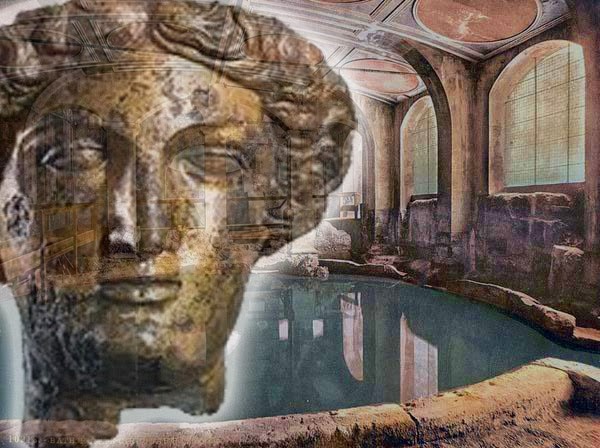 During Roman times these baths were named Aquae Sulis, honoring Sulis as the Great Goddess of this site. The Roman’s merged Sulis with Minerva, thus giving Sulis rule over home and state. As Sulis/Minerva, She was the Goddess of City, Handcrafts and Agriculture. Through Her association with the warrior aspects of Minera, Sulis had the power to witness oaths, catch thieves, and find lost objects. Many curse tablets found at Bath call on Sulis to cast punishment on the guilty. Sulis, Goddess of Healing, Prophecy, and Blessings is associated with healing waters and served by priestesses who kept Her eternal flame burning. The perpetual fires and the hot waters remind us of Sulis’s origins as a Sun Goddess. Her symbols are antlers, symbols of the sun’s rays, and eyes, symbols of the sun. She is often depicted with an owl, symbolizing wisdom. Sulis’s power reflects the divine light of the sun filtered through the healing power of water, helping Her human children and their plants to grow and prosper. When Sulis appears take note of any psychic visions or premonitions while seeking Her help in their understanding. Place a statue of Sulis in your garden to aide in the nourishment of the plants. On your next visit to a hot spring, invoke the name of Sulis as you meditate on the healing of your body and soul. Call on Sulis for blessings on your personal journey to light, health, and wholeness.